Recently, after posting about a few of our Little Saints Flannel Board Pieces, I was sent a sample product to review for Story Time Felts. My children all *LOVE* playing with Flannel Boards, so I was more than willing to look through the catalog, and check out their products. When the sample arrived, I was very excited to receive a Christmas Tree Advent Calendar. (Thank you Karen!!) I know it seems early to talk about Christmas, but did you realize that Advent begins in less than 8 weeks? Anyways, this little Christmas Tree Advent Calendar is sooo cute! I was very pleased to see that the company used the words "Christmas" and "Advent" (A very important detail to me...), as well as quite a few religious pieces. It comes with paperwork that explains the meaning and/or history of each felt symbol! For example: "Red Christmas Ornament -- Red is the first color of Christmas. It was first used by the faithful people to remind them of the blood which was shed for all people by the Savior. Christ gave His life and shed His blood that every man might have God's gift to all, Eternal Life. Red is deep, intense, vivid--it is the greatest color of all. It is the symbol of the gift of God." There are even activity suggestions for some of the pieces. For example: "Gingerbread House -- At the Christmas season there are plenty of good foods to eat and parties to go to with their delightful Christmas decor. It's not this way for everyone. Fill a bag with canned goods and take them to your local food bank to help someone less fortunate than you enjoy the Christmas season." Star, Donkey, Poinsettia, Christmas Caroler, Blue Christmas Gift, Red Christmas Gift, Red Christmas Ornament, Christmas Tree, Ice Skates, Three Wise Men, Shepherd Boy, Manger Scene, Church, Gingerbread Boy, Bell, Candle, Wreath, Christmas Card, Candy Cane, Santa Claus (we'll call him St. Nick! ), Angel, Present with red ribbon, Gingerbread House, Soldier, and Dove. The only thing I don't like about it, and this goes for any pre-made Advent Calendar, is that it is not an accurate countdown of Advent. Advent Calendars should begin on the first Sunday of Advent and end on Christmas Eve. Every year this date changes and can be as early as November 27 or as late as December 3. HOWEVER, the nice thing about this Felt Advent Calendar, unlike our Wooden Advent Calendar, is that I can easily add a few pieces on my own to make up for those days. I also really *LOVE* their Religious Advent Calendar. Anyways, to wrap this up, Karen Clark (Executive National Director of Story Time Felts), has graciously offered $25.00 Worth of Story Time Felts to one of my visitors!! All you have to do to be entered, is head over to Story Time Felts and take a look at a few of the other products, and then come back and tell me your favorite... OR... just tell me what you like most about this Advent Calendar! Please do so by Thursday night, and I will hold the drawing and post the winner on Friday! i tagged you for a quick fun game Jessica! I really liked the make a face felt. I think it's great that the product is multi-cultural. Thank you for letting me know about this website. My 1 year old would love some of that stuff. I am a new reader to your blog, but as a Catholic stay at home mom hoping to homeschool, I love to read your posts! God Bless! 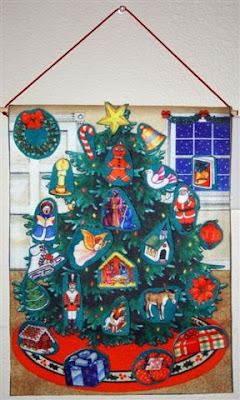 Got to love their religious advent calander made of felt! The best part to me is the fact that St. Jospeh and Our Lady "journey" over the period of Advent to the stable in Bethlehem. Of course, that it is reusable makes it even better. Although I have not been blessed with a husband or family (yet!) I hope to someday put such Advent-provoking thoughts into the minds of my little children someday! I liked the cute felt doll and all the clothes for it (like a paper doll). P.S. How does one get to be a "product tester"? I wanna be one of those gals! FREEEEE STUUUUFFFFF is awesome. One thing I really like about this felt advent calendar is that the meaning for all of the objects are included. I have the Bible story felt set, and you are so right about it being worth every penny to have the pieces pre-cut! I've had mine for several years, and in cleaning out a closet I just found another sheet of backgrouds/trees that didn't get cut out! My fingers were killing me... I probably hid them on purpose at the time! The Advent calendar is really cute, and I love the explanations of each of the pieces. I love the advent calendar! I'm always looking for great ways to connect my children to the true meaning of Christmas! Wow...what an awesome site...I can't believe how many felt board activities it has... I really liked them all!! So many to choose from and they look like they are well made and reusuable!! I agree....way too cool of a site. Some very creative people out there. I also like the felt Advent Cal. Kids like it too! Thanks for the great review! :) I wanted to address a couple things - Ginger, the company has been in business 20 years this year - used to be called The Story Teller! You probably bought this way back when they were new! Felt boards and other 'classic toys' are making a comeback as parents are tired of the electronics turning kids into ones who don't know how to play or imagine! I am glad you 're-found' us this way! Sandra - I've met a lot of people through the years who find some uncut in their closet! I am so glad the company offers everything precut now! They send them out to stay at home moms and college students in the community who cut them out for a small fee. It has been wonderful! It's been fun reading all the comments, thanks again for reviewing Story Time Felts! The Aesop's Fables Activity Book and CD and the Transportation Activity Book look wonderful! Thank you for the giveaway! Neat! We haven't tried any felt things yet, as I am afraid of all the cutting! I'll have to take a closer look at the web site -- the dolls looked cute! Stack up Snowman in the math section... really cute for adding this winter!! There were so many that I made myself quit looking or I'd have been at it all afternoon! It was fun to look around! What I like about your Advent board was that it looked like it would be easy to store! I was lucky enough to see it in person! 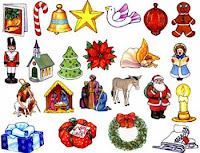 I LOVE the Advent calendar too, so many items with their meanings AND....ALL PRE CUT. The Math items are cool, as are all the story time items. I think i mught order the Music Set. Punky is SOOOO into music. BUT..... What I LOVE most.... everything is made of ALL AMERICAN NON TOXIC WASHABLE materials. WAY TO GO FUN FELT!!! I like this Advent Calendar better than the one that I've been using for a couple of years with my little ones. I like that there are explanations for the different objects and that it's pre-cut and basically not a time-intensive project to incorporate with your family preparations for Christmas. Hi, i was at their site yesterday and i love all of their stuff. having a son who loves to touch, it is his way of learning, i was really pleased. what i like about this calendar is that my kids can touch it and St. joseph and Mary's journey makes it so much more real to them!! !